Happy Birthday, Dame Nellie Melba, on this 19th day of May! We were thrilled to visit the former home of the opera legend recently and love that it is now open to the public. Right next to the carpark, the gobsmackingly beautiful scenes begin, at an avenue of trees sprinkled with barrels of geraniums, and views of dams, paddocks and mountain ranges. We were met at the grand Cypress hedged entrance by the lady of the house, Dora. A shy, timid girl, she gave us a bit of a sniff and then decided we were ok. The next 10 minutes were spent patting and cuddling this gorgeous pooch. Highly recommended experience. The courtyard leads to the cellar door of Coombe Farm and a providore store selling all sorts of fab things, like these funky watering cans. The clock tower features a fox weather vane and the words "East West Hame's Best". I think it's a fox. It could be Dora the dog. The tower sits atop the former motor room/garage, which has been transformed into a 150 seater restaurant. 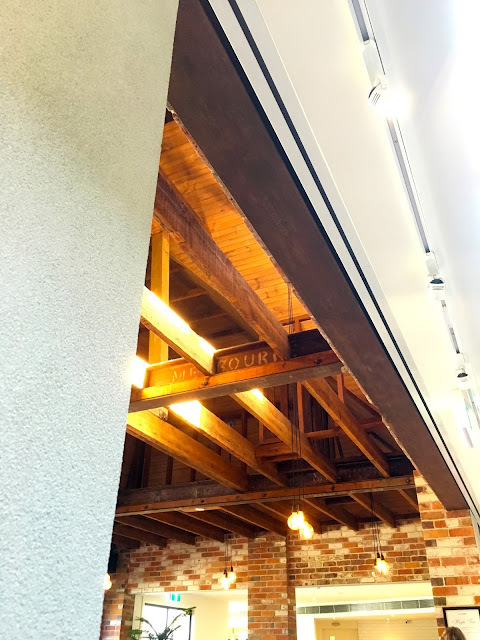 Exposed brick and timber beams from a previous era meet modern industrial style lights. Crispy Confit Duck Leg and the Yarra Valley Beef Burger were our mains choices, and we saved room to share a dessert. Peach Melba, of course. Next to the restaurant, the Gallery is a mini museum of all things Melba. Portraits, paintings, photographs and luggage from Dame Nellie's collection are housed in the rooms. Glimpses of the garden and cottage can be seen from the restaurant, so we walked around the other side of the building, along the fence line and back to the carpark. ...and the oldest swimming pool in Victoria. We had arrived too late for the morning Garden Tour, and couldn't do the later tour, as we had school pick-up, but will definitely revisit for a better look at the gardens. Oh and the scones. With jam. And cream. I definitely want a better look at those. A stop at the Coldstream Op-Shop on the way home scored us some seriously CHEAP books and these cool planter boxes, made from recycled fence palings by a local and selling at the very good price of $3 each. We took 3 of them home, popped some seedlings in and they now sit in our courtyard, like portable vege gardens.